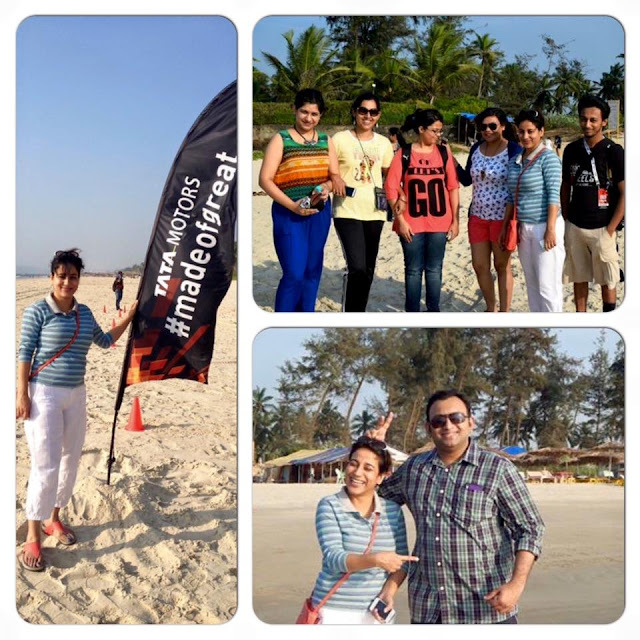 Home ReviewsAutomobile	A Fantastico Goa Weekend with Tata Tiago! 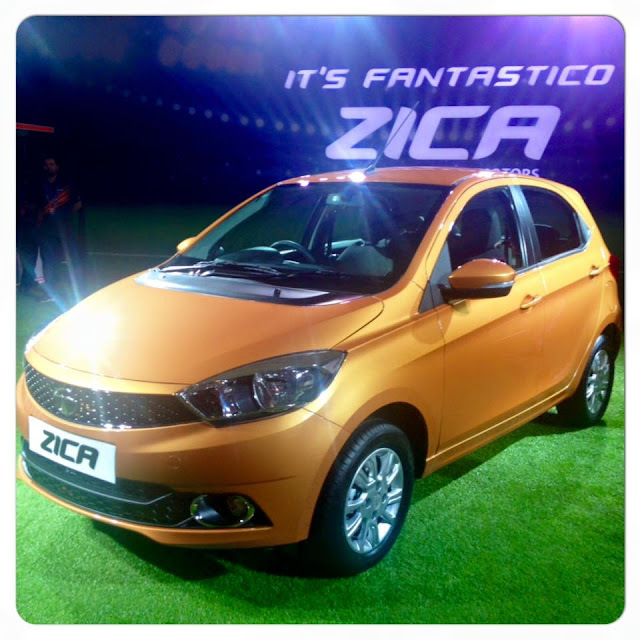 Update: In view of the recent outbreak of the Zika virus, Tata Motors has renamed its soon-to-be launched hatchback Zica as Tiago. I got an opportunity to test drive this fantastic car in Goa a couple of months ago, and this is an account of the wonderfully executed launch event. 2015 was a Goa year for me. For reasons both personal and professional, I got opportunities to visit this state all through the year. And just as I was thanking my travel stars for the many Goa sojourns, there landed in my lap, another wonderful opportunity to spend an exciting weekend in this beautiful state – this one was from Indiblogger, a leading bloggers network, inviting select bloggers to Goa to test drive and experience first-hand Tata Motors’ new, yet-to-be-launched car, the Tata Tiago. The invite hinted about a weekend of long drives, beach fun and lots of revelry with top bloggers from across the country. Now who would say no to an invite as tantalizing as this! After half a day of connecting flights, I landed in pleasantly warm Goa (a relief from north India’s bone-chilling cold), looking forward to getting introduced to Tiago, the latest offering from Tata Motors. Many of the fellow bloggers who had already landed from different corners of the country had got on with the introductions and soon there was a big happy group of bloggers outside the airport, busy chatting, making new friends and going click-click with their cameras. 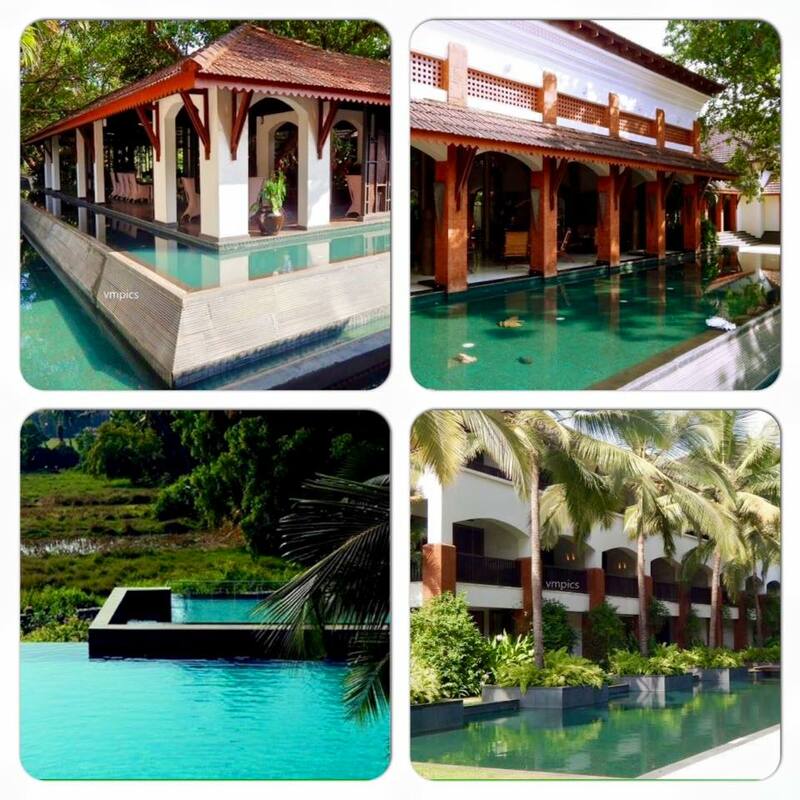 About a half-an-hour long drive from the Dabolim airport and the bloggers checked into their home for the weekend – the gorgeous Alila Diwa, an elegantly designed resort located in Majorda in south Goa. Set amidst a serene landscape, this property is striking, to say the least. The ambiance at the entrance lobby was beautiful, with delightful surroundings and the vivaciously welcoming Indiblogger and Tata Motors’ marketing team. Post a warm welcome and registrations at the Tata Motors’ reception desk, it was time for lunch, where besides sampling the delicious buffet spread, many virtual blogger friends finally got to meet and greet each other. The sense of camaraderie was heart-warming and soon everyone was chatting as if they had known each other forever. And it was here that I got to meet my roommate for the weekend – the pretty Maitreni Mishra, a popular fashion and lifestyle blogger. Lunch done, it was time to head to our respective rooms for some much-needed rest, before gathering back in our beach attire for some fun activities at the Gonsua beach which was just 5 minutes’ drive from the resort. 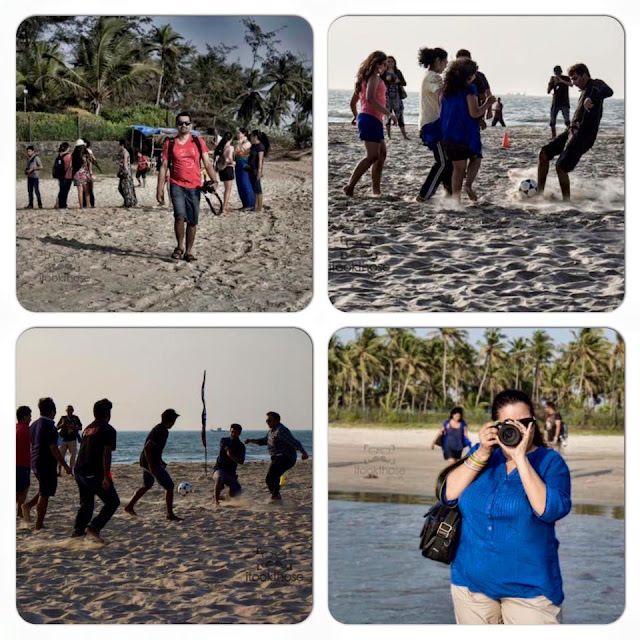 At the beach, football and photography frenzy took over everyone, and if one could not spot any particular blogger at the makeshift football field, they were sure to find them by the crashing waves, capturing the scenery as well as fellow bloggers in their cameras. After almost an hour of frolicking on the beach, we were back at the resort to freshen up and head for the high tea hosted by the Tata Motors’ team. While the high tea was fun and entertaining, what took the entertainment quotient several notches higher was the players’ locker room session with the evening’s host and ‘coach’ Cyrus Sahukar, the immensely popular and affable VJ and actor. But before Cyrus made an appearance, all the bloggers were pleasantly surprised to find personalised Tata Motors hampers displayed in make-shift lockers with their respective names. Once everyone picked up their kits, it was time for coach Cyrus to take over and regale the audience with his wisecracks about all things football. 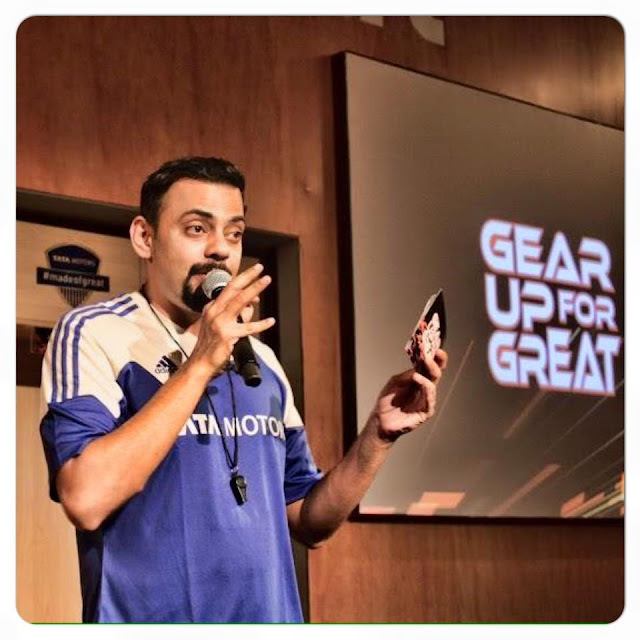 The mock warm up exercises and basics of coaching done with, it was time to get formally introduced to Tata Motors’ newest offering in the hatchback segment – the Tata Tiago, which is all set to be launched in January 2016. 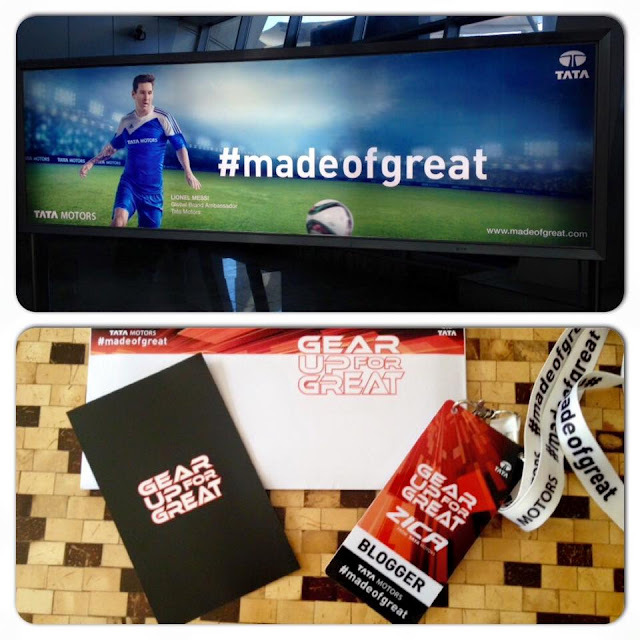 And for the introduction, it was the marketing and technical team from Tata Motors who took over. It was an interesting session where Tata Motors’ representatives acquainted the audience to Tiago’s features and also explained about the new hatchback’s many USPs. The highlight of this session was Ms Delna Avari, Head of Marketing and Services at Tata Motors sharing the background story about signing up football icon Lionel Messi as Tata Motors’ global ambassador. 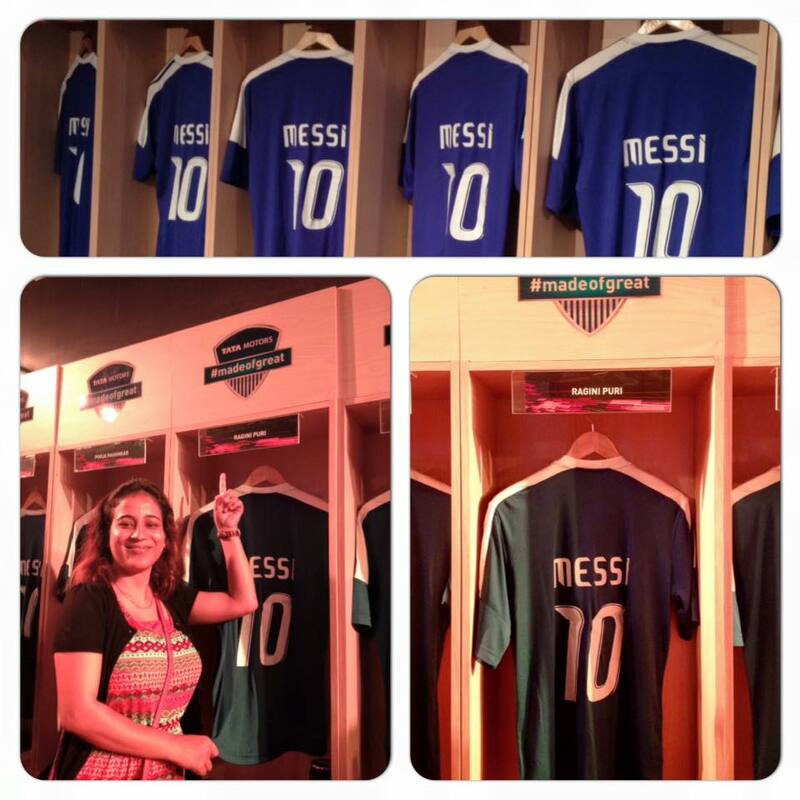 The many anecdotes she shared about Tata Motors’ marketing team’s interaction with Messi kept everyone hooked to her every word. And soon it was time to come face to face with the evening’s centre of attraction – Tiago. With its compact and sleek design and attractive burst orange colour, this newest Tata product immediately evoked many a loud WOWs and #FANTASTICOs from the audience. Here’s the first look of the car, dazzling to say the least! The evening was also about networking and photo-ops, with bloggers reaching out to each other to know about the kind of blogging niche the other specialised in, and learning and taking inspiration from each other. Upping the entertainment quotient of the evening was the fabulous karaoke session, where many bloggers showcased their superb singing skills. Some fun activities too followed, one of which involved picking up team mates for the Tiago test drive scheduled for the next day. And here’s my happy team, comprising the very popular and multi-talented Dr. Roshan Radhakrishnan and the very gorgeous and super creative Ankita Singhal. While the activities wrapped up around dinner time, the karaoke session continued through the dinner, which again was a sumptuous affair. The fun conversation continued post dinner till late into the night and post a little stroll around the vast resort property, it was time to hit the bed so as to be up early for the Tiago Drive. 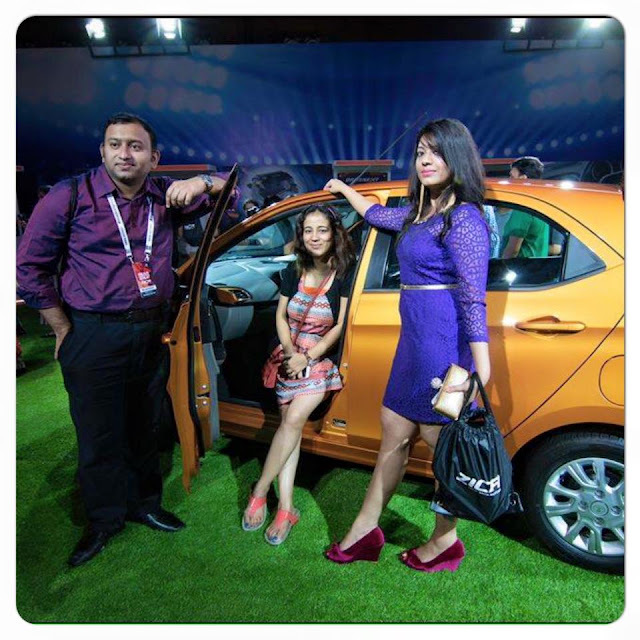 Needless to say, every one of us was excited about the day and looked forward to having a great time driving the new Tata Tiago! This is all for now, hope you enjoyed the post. Stay tuned for my Tiago test drive experience and the car review which is coming up next on the blog. Thanks and happy travels! It sounds like such a fun event! Btw, Your photos seem a little stretched vertically. Or is it just my eyes?